« More shows coming up and an EP thats almost done! 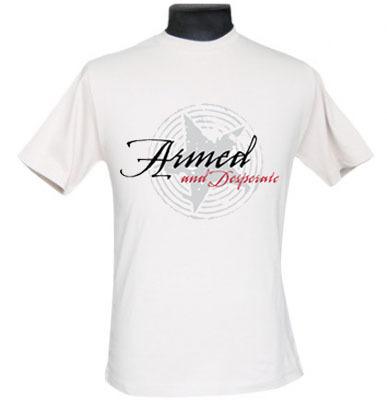 New Armed & Desperate T-Shirts are in! The new armed and desperate T-Shirts are in. They are available to order online here on our website and will also be available at our next show. Your support is much appreciated and we hope you are as excited as us. We’d like to give a big thanks to Bruce from Elemental Studios for donating his time and company resources to give us our new logos. Their design work is amazing, we couldn’t be happier. The Shirts are available in the following options. Men, Women and Youth Sizes. This entry was posted on Friday, July 30th, 2010 at 3:18 pm	and is filed under A&D News. You can follow any responses to this entry through the RSS 2.0 feed. Both comments and pings are currently closed.